Located on Dubai’s famous retail and leisure strip 'The Walk', Amwaj Rotana Dubai Beach Residence has a lot to offer its guests. This 5-star accommodation is moments from popular attractions including the iconic Jumeirah Beach, Beach Mall, Mall of Emirates and Dubai Marina – making it a great choice if you like to be close to the action. Featuring 301 well-furnished and incredibly spacious rooms – each with its own balcony - Amwaj Rotana Dubai ensures ultimate comfort when it comes to amenities. Spend time lounging by the swimming pool, make use of the Bodylines Fitness & Wellness Club (equipped with a sauna, jacuzzi, gym and massage treatments), or keep the kids occupied at the kids' clubs with fun-loving activities on offer for children ages 4-10. 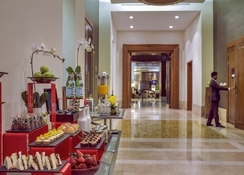 Amwaj Rotana Dubai has an impressive dining and entertainment scene, with award-winning restaurants such as Benihana, and Fumo Lounge by Rosso to indulge in. The Amwaj Rotana Dubai is just a 5-minute walk from the nearest beach and is located along ‘The Walk’, one of the liveliest strips in the city. You can also reach the Mall of Dubai, which is 15km away via a free shuttle service. 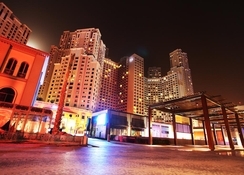 Dubai International Airport is only a 30-minute car journey from the residence too. Amwaj Rotana Dubai Beach Residence comprises 301 rooms and suites, boasting the largest average space for a hotel room in the area. All the rooms and suites have their own balcony and guests can choose from the 42-square meter Classic Sea View room to the 130-square meter Presidential Sea View Suite. Amenities in all rooms and suites come include air-conditioning, mini-bar, tea and coffee facilities, satellite TV and daily housekeeping service. 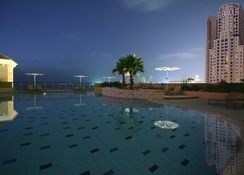 Amwaj Rotana Dubai Beach Residence offers a wide range international and local cuisines in its numerous restaurants. The JBR Gastropub specialises in British and American food, for a more causal vibe with sports on the TV and a live DJ. Benihana's fine dining venue features quality American/Japanese cuisine, specialising in seafood, sushi and Teppanyaki. Head to Rosso for Italian dishes and exquisite cocktails, while Horizon features all day buffet meals prepared with food from around the world. Within the hotel, you will get access to the relaxing Sundeck Pool Bar and Atrium lounge café while the Fumo lounge has recently open which features shisha with a variety of middle eastern food. 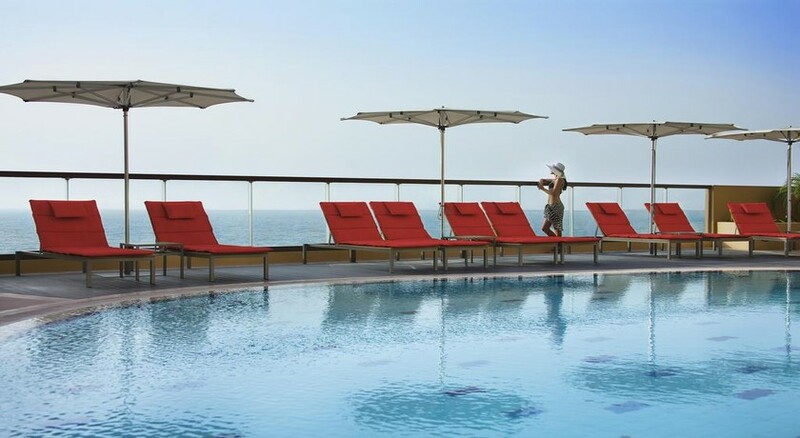 The Bodylines Fitness and Wellness club is popular at the Amwaj Rotana Jumeirah Beach Residence, with temperature-controlled pools (for adults and kids), a sauna, spa and for fitness lovers, a gym and personal trainer. The Flipper Kids Club is available for children aged 4 – 10, with a wide range of activities to keep little ones amused. 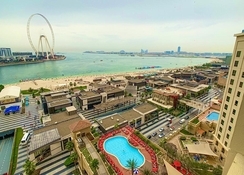 Plus, the hotel also features handy beach kits consisting of an umbrella, towels, chilled water and a mat for the close-by exclusive stretch of Jumeirah Beach. The Amwaj Rotana Jumeirah Beach Residence offers both a relaxing and activity filled holiday in Dubai with rooms, facilities and nearby locations that offer something for everyone that visits.